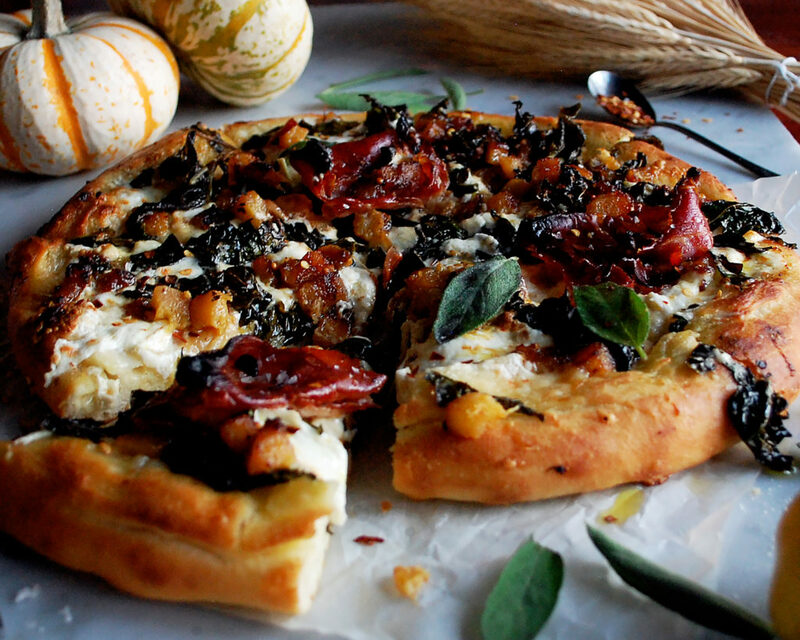 It’s the middle of the week, and I couldn’t think of a better time to whip up some burrata pizzas! Yes, it is a process to make the dough, but if you plan ahead and fit it into your schedule, it is so worth it. The dough is fluffy, a little chewy, crisp on the edges, and just all things delicious. 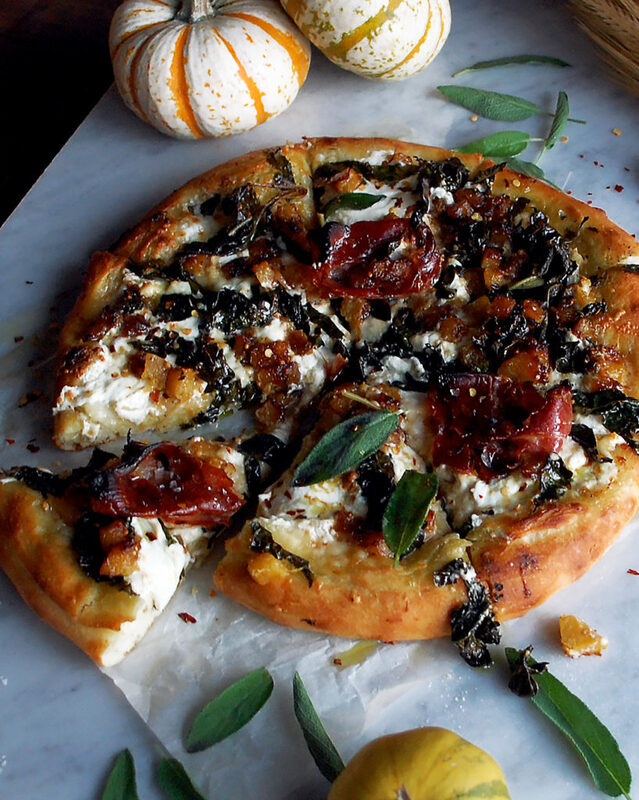 Here’s the thing about the pizza dough… You need to make it one day before you want to use it. So, basically just plan the night you want to make your pizza, and make the dough the day before. 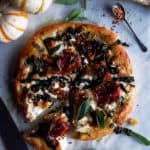 This is kind of nice because then, on the day you want to make the burrata pizza, the dough is ready to be rolled out, topped with the best autumn-inspired toppings, and devoured! The pizza dough recipe comes from “The Pizza Bible” book, so you know it’s got to be good. My biggest suggestion is to read the recipe fully, even twice if you want, before even going out to buy the ingredients. 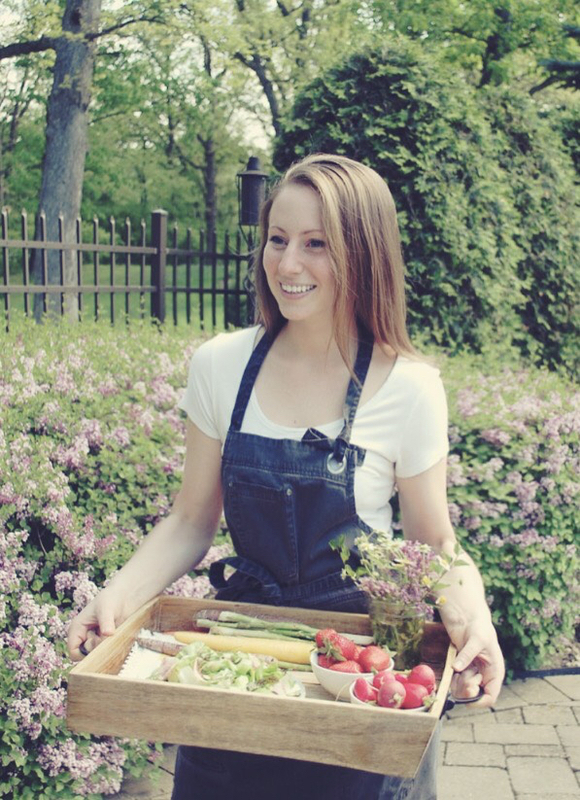 It’s always good to know exactly what is involved, especially with recipes that take two days to complete. My other tip for the dough is to pay careful attention to the first step in the process: dissolving the yeast. You don’t want to miss this step…it’s what gives the dough its life. When whisking the yeast, if it doesn’t dissolve in the water, it probably means the yeast is dead. It needs to be thrown away and new yeast should be used. So, now that we’ve covered the dough basics, it’s time to talk about toppings. I am so, so excited about how this combination turned out. 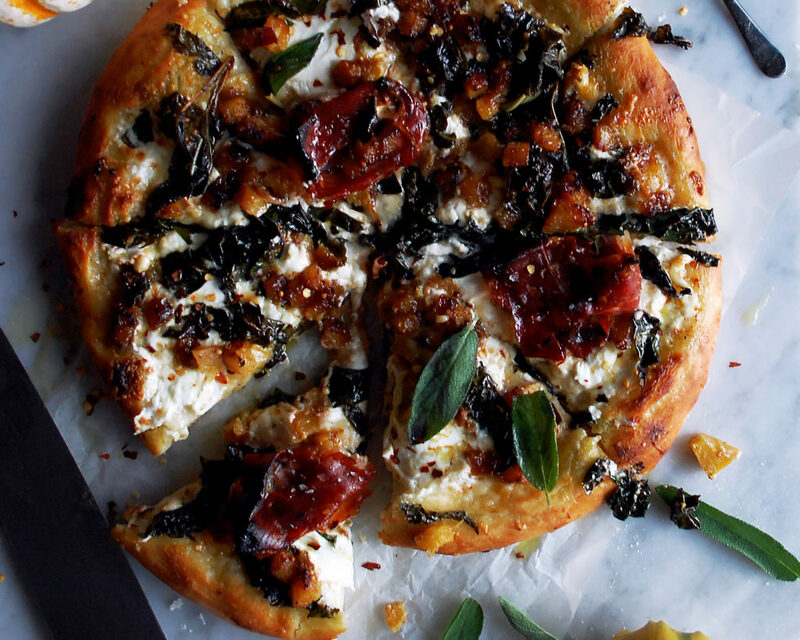 It’s basically all things fall piled onto one thick, crispy edged, fluffy pizza pie. I’ve used butternut squash in this recipe, but really any autumn squash will work. I diced it pretty finely and sautéed it with sage and maple syrup, creating the most perfectly sweet combination to add to the pizza. I just love it. I finish the pizza with more sage and a little bit of red pepper flakes, just for that extra kick of heat. You are going to love it! Add the active dry yeast to a small bowl. Add the warm water and whisk aggressively for 30 seconds. The yeast should dissolve and create a foamy mixture. In the bowl of a stand mixer, add the flour. Using a dough hook attachment, run the mixer on low speed and pour in most of the ice water. Reserve about 2 tablespoons. Then, pour in the yeast mixture. Add the reserved ice water to the yeast mixture bowl to help retrieve any bits of yeast that may be stuck to the bowl. Add this into the mixer bowl. Mix the dough on the lowest speed for 1 minute, or until most of the dough pulls away from the sides of the bowl and comes together. Use your hands to pull the dough off the hook and away from the sides. Check the bottom of the bowl for any unincorporated flour. Press the flour into the dough. If the dough is dry, add small amounts of water until it holds together. Add the salt and mix for another minute. Use your hands to pull the dough off the hook and use a spatula to scrape down the sides of the bowl. Add the oil. Mix for 1-2 minutes until the oil is absorbed, stopping the mixer occasionally to pull the dough off the hook and scrape down the sides of the bowl. Transfer the dough to a clean, un-floured work surface. Knead for 2-3 minutes. Cover the dough with a damp towel and let rest for 1 hour at room temperature. Cut the dough in half and form each piece into a dough ball. Wrap the dough balls in plastic wrap and refrigerate for 24 hours. Remove the dough from the refrigerator the next day and let sit at room temperature for 30 minutes. Heat a large sauté pan over medium heat. Coat the bottom of the pan with olive oil, enough to cover an even layer. When the oil is hot, add the diced autumn squash and sage leaves. Season with salt and freshly cracked black pepper. Stir the squash until it becomes tender and caramelized, about 6-8 minutes. Add the maple syrup and continue to cook for a few minutes until the syrup cooks down and coats the squash. Turn off the heat and set the squash to the side. Meanwhile, slice the kale leaves into strips, about ½” thick. Heat another large sauté pan over medium heat. Coat the bottom of the pan with olive oil, enough to cover an even layer. Add the shaved garlic and cook for 30 seconds until fragrant (be careful not to burn). Add the kale and stir to coat. Saute the kale until it wilts slightly and becomes tender, about 5 minutes. Season the kale with salt and freshly cracked black pepper. If the kale becomes dry before it gets tender, add a few splashes of water to the pan. The water will help the kale cook and soften. Turn off the heat and set the kale to the side. Preheat the oven to 550°F. Use your hands to stretch each ball of pizza dough on a floured surface into an even circle, roughly 10” each. Make sure the dough is level and that there are no tears. You also want to make sure the dough is slightly thicker on the edges for the crust. Once you’ve rolled out the dough, place two sheet pans in the oven, inverted, to preheat (or use pizza stones if you have them). All toppings should be placed on the pizza in an even layer, leaving a ½” edge of dough for the crust. Start by distributing the fontina cheese evenly across each pizza. Then, tear the burrata (I like to do this over paper towels first) and arrange it evenly across the pizzas. Add the prosciutto slices, working to fill in the holes left by the burrata. 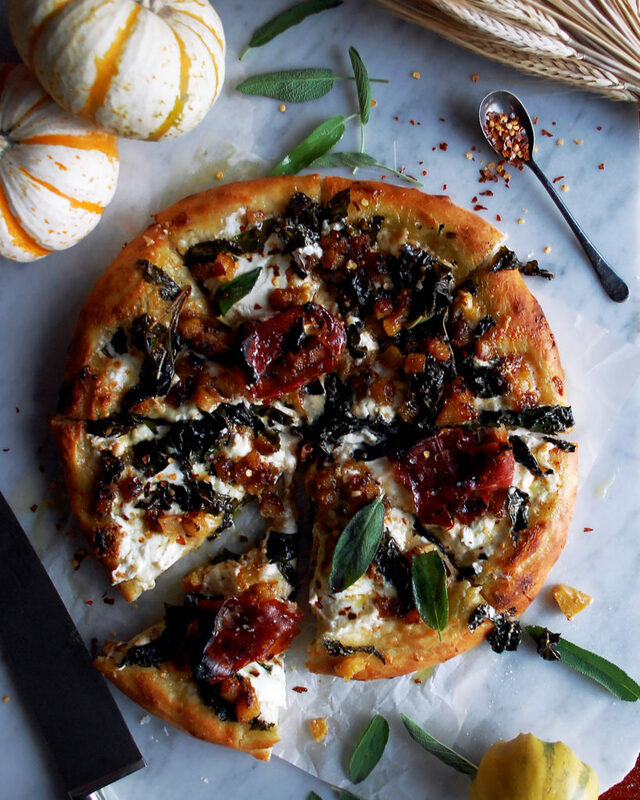 Distribute the sautéed butternut squash and kale over top, trying to fill in all of the empty spaces to ensure the entire pizza is covered with toppings. Drizzle olive oil around the edges of the crust. Use a lightly floured pizza peel to transfer the pizzas to the pre-heated, inverted sheet pans in the oven. This takes some practice and has to be done in one swift motion so that the pizzas do not tear or get stuck. Bake the pizzas for about 6-8 minutes, or until the crust is golden, the bottom of the pizza is firm, the cheese has fully melted, and the toppings are heated through. I like to give the sheet pans a turn half way through the cooking process. Transfer the pizzas from the sheet pan in the oven to a cutting board, using the pizza peel. Cut each pizza into 8 slices. Garnish with sage leaves and red pepper flakes. For a simple, classic steak dinner, check out my previous post: Ribeye Steaks with Cauliflower Puree & Buttered Mushrooms. It’s got hints of garlic and fresh thyme throughout the entire dish, and is just perfect for honestly any night! Thank you!! I just love this pizza. It is so perfect for fall.